Normally, January and February in the Sea of Cortez are considered 'crazy', as the northerlies blow hard from the high pressure that builds up over the desert in Arizona and New Mexico. Our plan had been to take any relaxation in the winds to get as far north as we could, preferably to Santa Rosalia, about half way up the Sea. We would then be able to amble gently south with following winds. Thus, after a quick stop at the village of San Evaristo to investigate the goats, salt pans and the community's huge reverse-osmosis water-maker, we headed north, motoring in calm conditions right the way up to Bahia Concepcion. As we arrived, just before one of the typically ostentatious desert sunsets the Baja lays on, we wondered whether we had come to the wrong place. Where we had expected a deserted beach, with perhaps a few cruisers anchored off, we found a phalanx of RV's large and small, backed by palapas. Originally the latter were all open-sided thatched huts, but many of those at Playa Santispac had grown to become full-fleged houses, with second stories and satellite dishes on rooves covered with solar panels. Our first reaction was horror and a feeling that we wouldn't be staying long. By morning, we were still skeptical, but decided to row ashore and reconnoiter. As we walked along the beach, we found that most of the land cruisers were from Canada, escaping winters in Alberta and northern BC. We hardly managed 25 consecutive yards without a friendly conversation and offers of lifts into town. By the time we rowed back to our water-bourne RV, we were willing to admit that perhaps they all had a right to be here, even if their vehicles weren't as attractive as 'Sunstone'. 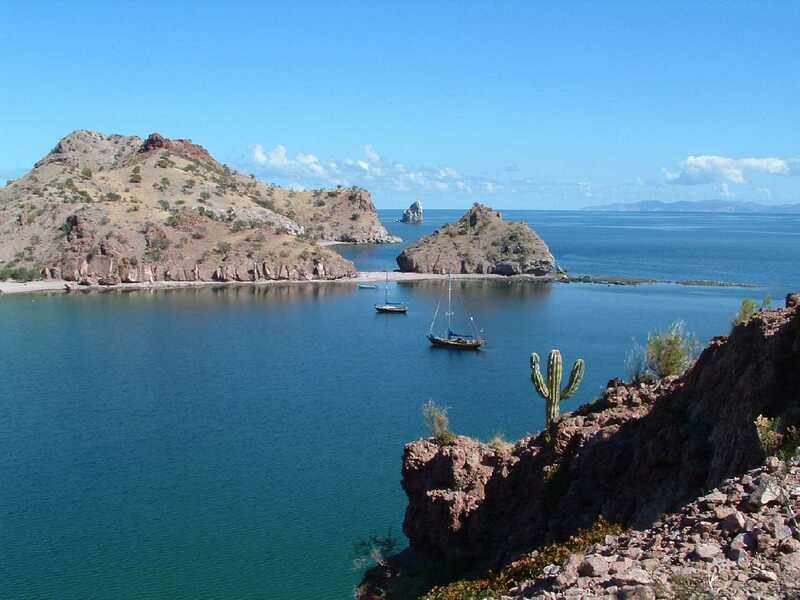 A lift into Mulege (pronounced Mulahay) the next day brought us face-to-face with stereotypical rural Mexico. Though it was mid-morning, hardly anyone moved around the starkly sunlit streets. Occasional bursts of La Bamba sounded from a boom-box somewhere out of sight. The town seemed so sleepy as to be almost comatose. Appearances can be deceiving. 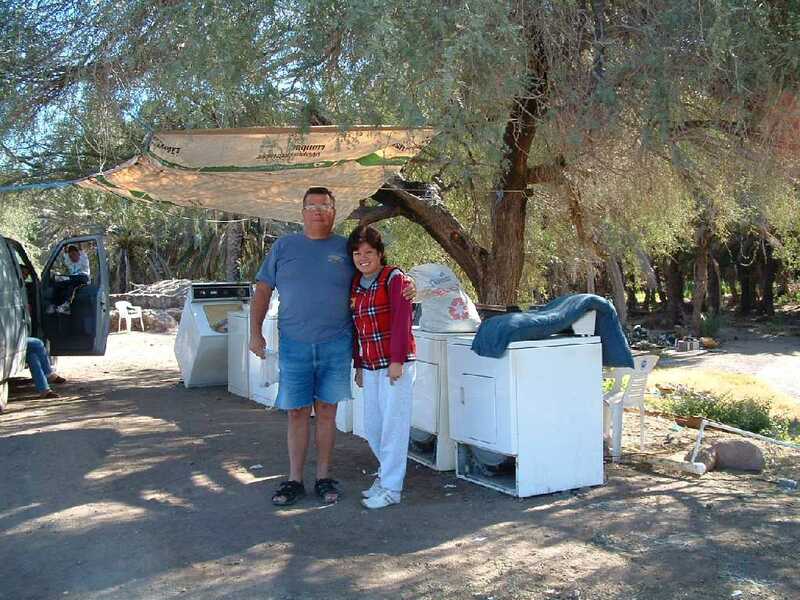 When Gordo, our Canadian driver, went to collect his laundry, there was Rosa with everything ready for him, standing in front of her row of washing machines, neatly lined up on the packed earth of the lot on which her laundry had stood - before it was swept away by the flooding during hurricane Marty. Rosa, like many Mexicans, was in business, determined even in the most difficult circumstances to work hard to make a go of things. Santa Rosalia when we reached it couldn't have been a greater contrast to Mulege. The town bustled, everyone was busy with something and going somewhere - even if they had to step around the dead dog in the street to get there. Originally a company town of a French mining consortium, the town's architecture is distinctively un-Mexican, with clapboard houses and a prefabricated church designed by Eiffel. Amazingly this little place was visited by a cruise ship on one of our days there. This had the unexpected benefit that there was a display of local folk dancing for the benefit of the passengers, which we happily gate-crashed. Naturally once we had reached our furthest north point, the northerlies disappeared, so we motored our gentle way south. Though the anchorages of the Baja generally have in common a craggy, desert landscape, a few stand out in typifying that stark beauty. Of those on the mainland, San Juanico and Aqua Verde were particularly attractive. The former is a bay well sheltered from the winter northerlies. There are a number of large offshore rocks, one of which is refered to as 'Prudential' by cruisers, for its similarity to the insurance company's Rock of Gibraltar logo. The Bay is also rimmed by sandy beaches, begging to be combed and has a tidal lagoon begging for dinghy exploration at high water. Unlike most attractive sea frontage in the Baja, San Juanico has little or no housing development. Elsewhere, 'Gringo villages' of holiday homes have been sprouting. At Aqua Verde, by contrast there is a largish Mexican village (pop. about 300). Walking through it you could easily be in rural Mexico several decades ago. Though the village has piped water, this is a recent development. There is no electricity, apart from what can be won from a few solar panels. The fishermen have outboards and there a few pickups, but we got the feeling that the village's huge herd of goats was a good deal more important. Anchoring inside the question mark hook of Isla San Francisco's mile long beach was also a pleasure. 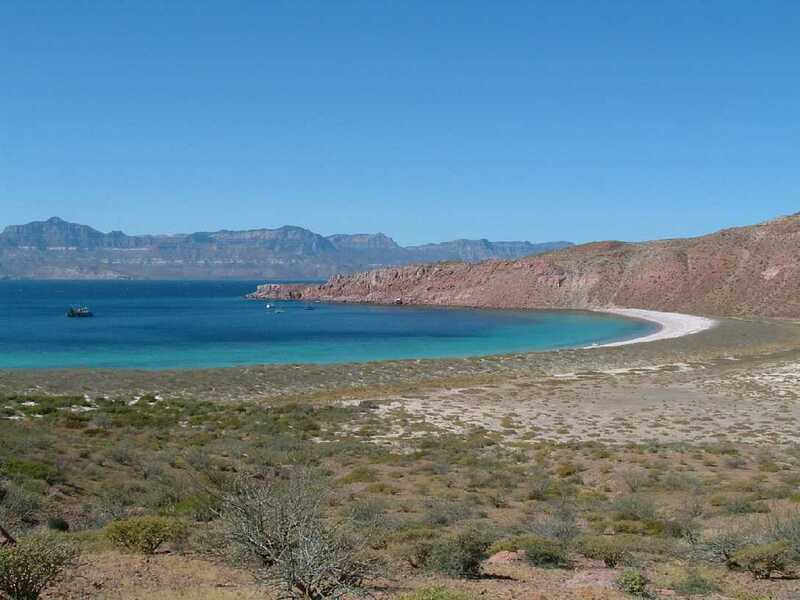 Especially since the island offered the chance to explore its high bluffs, giving a panoramic view of the southern part of the Sea of Cortez. Despite the heat of the days in the Sea, the evenings were generally comfortably cool, while the water was less than comfortably cool. It was not until we got to Isla San Francisco that the water reached the mid 60's (F) and we decided it was just warm enough for a snorkel. Unfortunately, once you have sorkeled in the Tuamotus, both the water clarity and the variety of fish are a bit disappoiting in the Sea of Cortez. We returned briefly to La Paz to varnish, fuel and stock up with American goods, which we gathered were not available on the mainland. The return to well-trodden ground made us feel like old Mexico hands though we'd only been in the country a couple of months. Bill and Jane on Vagrant were already pushing on well ahead of us to get ready for their passage to the Marquesas and across the Pacific to NZ. Our other OCC friends, Bob and Betsy Baillie on Belair, were on a fast track down the coast, pushing to reach Chile by May and then leave the boat to return to Bermuda. We hoped to meet with them again later in the year. The high - or low - of this visit to La Paz was the opportunity to watch the Superbowl. Though the game itself was unusually exciting for a Superbowl (assuming that you have a taste for American football in the first place), the half-time spectacle confirmed many of the problems of attitudes and popular culture which so concern us about America today. Fortunately they concern many Americans as well, which may be the solution in the long term.